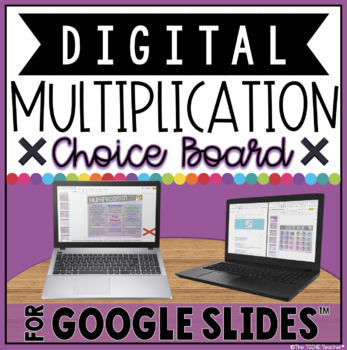 This digital choice board, or choice menu, for Google Drive™ contains engaging and paperless activities for students to use and practice basic multiplication facts and different strategies. It makes a great way to differentiate for all learners! Students must have their own Google account in order to use this product. This will work on Chromebooks™, laptops and computers. It is NOT intended for iPads. 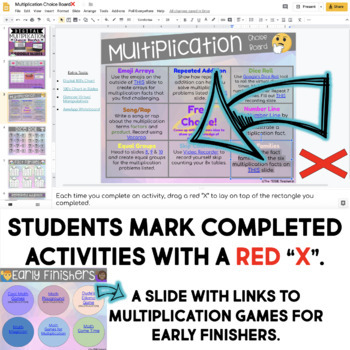 The digital choice board contains 9 different digital activities that can be marked off as they are completed by dragging the translucent red "Xs" to lay on top of the rectangles that describe each activity. The text on the choice board is EDITABLE so you can change out or rearrange the activities to fit your needs. Students can use it like a tic-tac-toe board OR you could have them complete all of the activities throughout the week. IMPORTANT! This product does NOT! teach you HOW to use these tools. Students must be familiar with how to use Google Slides. The web tools that are linked in are very intuitive for most students. These slides can be duplicated as many as you need throughout the year! They are set to print on 11x8.5 paper if you want a hard copy. ★ Repeated Addition: Show how repeated addition can help you solve the multiplication problems (these can be edited) listed on Slide 7. ★ Dice Toll: Use Google’s Dice Roll tool (linked in) to roll the virtual dice two times. Multiply the two numbers together. Repeat 7 more times. Use Slide 5 as your recording slide. ★ Song/Rap: Write a song or rap about the multiplication terms “factors” and “product”. Record using Vocaroo. ★ Free Choice: Come up with your own idea to show your knowledge of multiplication: I have linked in several digital tools on the side of this slide that students can use for this choice. 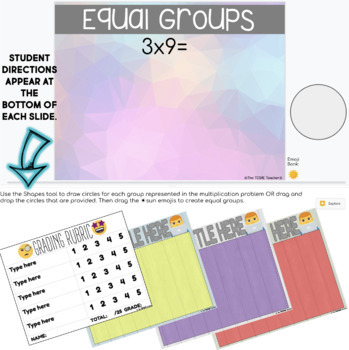 ★ Equal Groups: Head to slides 8, 9, 10 and create equal groups for the multiplication problems listed. 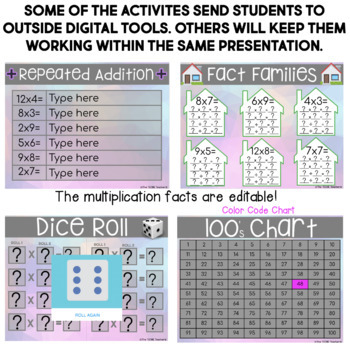 ★ Fact Families: Create the fact families for the six multiplication facts on slide 6. All web tools are hyperlinked so students can quickly and easily access the tool they need. ★ 3 editable slides for students to add links/screenshots to their creations. All slides can be duplicated as many times as you need. This product comes as a link in a PDF file. First, make sure you are signed into your Google account. Click on the link and you will be prompted to "Make a Copy". Rename the file to whatever you would like. It will be sent directly to your Drive! Disperse to your students via Google Classroom, Google Drive Shared folder, your Learning Platform, etc..